Thank you for taking the time to fill out the Five Star Review program questionnaire. Between now and the time we launch, will you please gather the following photos and have them ready to upload to the system? You will need these photos to get the very most out of your system. 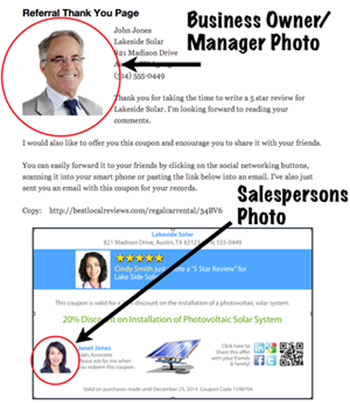 Your photo (or the photo of your manager) will be used to help your customers associate you with your business. We will use your photo for the following reasons. 1. To Brand you as the owner/manager of the business. 2. To allow your customers to associate a friendly face with your business. 3. To give your customers a feeling of familiarity with you, the owner/manager. Your photo will show up in multiple places throughout the system. 2. On the Thank You Page after your customer writes a review. 3. On the coupon if you are the only sales person for your company. * If you’re the only salesperson, the system will show your photo in the coupon. * If you do not provide a photo, a photo will not appear in the coupon. You do not need photos of your service people … just you or your manager, and your sales people.